Did you know that the Nissan LEAF is the best-selling electric car of all time? Launched in 2010, the first generation model left me very impressed and now, Nissan is fortifying their position by giving the all-new 2018 model what everyone wants; a longer range at a lower price. We are at the precipice of an electric vehicle onslaught, initially in the form of plug-in hybrids followed quickly by a number of pure EVs. Currently, there are 11 manufacturers producing a total of 14 electric vehicles. Many are only sold in select states. Range, size and price are the biggest variables. 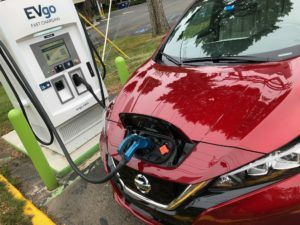 This new LEAF for instance utilizes a more energy dense lithium-ion battery pack to extend its driving range from the previous 107 miles to 151 miles. It also delivers more performance; 147 horsepower is up 37% and torque – the best part of the EV driving experience – is up 26% to 236 pound-feet . That means acceleration is livelier, and this LEAF – like all electrics – provides that instantaneous oomph that makes it sneaky quick in every driving situation. There’s nothing quite like the smooth, quiet, immediate response of an electrically driven car. Level I, II and III charging is permitted ranging in time from 35 hours to as little as 40 minutes with one of these big boys. As a bonus, Leaf owners get to use these fast chargers for 2 years on the house with one of these cards. Otherwise it costs about $12 to recharge. So you can use your standard household outlet in a pinch but charging is painfully slow. Installing a 240V outlet in your garage – like the one that powers your dryer – makes the most sense for LEAF owners and it’s now just that simple; a wall box is no longer necessary. These industrial quick chargers are great for travel and for times when you need to fill up pronto, but they’re too costly to install at home and take a toll on the car’s battery with repeated use. Just so you know the battery is warrantied for 8 years or 100,000 miles. The redesigned cabin plays well though it doesn’t exude the highest quality. I like the funky little shift knob, the driver displays are EV appropriate and the infotainment screen, while small, has the goods you want both for your smartphone integration and quelling range anxiety. When you’re driving an EV, you’re likely looking at your fuel gauge more often than you would in your gas-powered car and the LEAF provides all kinds of ways to visually depict how far you can travel, how many miles you have left and how using things like climate control deduct from the total range…very helpful stuff. An ECO setting will buy you a few more miles in exchange for decreased performance. And keep in mind, cold weather will create longer charge times and reduced range. The Leaf can seat 5 but more like 4 and is sized similarly to the previous model with raised, theater-style rear seats that give passengers a better view ahead. Cargo room is comparable to a Honda Civic Hatchback so there’s really pretty decent space with the seats folded. Though the LEAF is large enough to be considered a midsize car, the Chevy Bolt is not that dissimilar in its interior dimensions and it delivers a sizeable 87 miles more range. This top trim LEAF SL with the tech package and a few other goodies stickers for $38,520 and that includes intelligent cruise control with steering assist. A comparable Bolt is about $44,000. So if you need more range choose wisely. Both qualify for the maximum federal tax credit of $7,500 while additional state incentives may also be available. So ProPilot Assist is basically the combination of adaptive cruise control with stop and go and lane keep assist, steering the car for you while keeping you a safe distance from the vehicle ahead. It’s not really intended for hands off driving but you can do it for short periods of time – a nice tool to have in congested traffic. And then there’s the new epedal feature. It can be toggled on or off depending how you feel about it, ostensibly making the gas pedal also a brake pedal, simply by letting up on it to slow down or completely stop…a fun electric car feature that again works best in stop and go traffic. I like the LEAF and the way it goes about its business. It looks sharp and is well conceived. But I don’t care for the light gray leather interior with its Bio Suede inserts – it looks perpetually dirty. There are no USB ports in the rear…no center armrest either. And there’s no wireless charging pad. I’d also like to see LED fogs. The electronic safety features are all here though, the surround view camera is awesome and the touchscreen infotainment features full smartphone integration. It’s comfortable, the ride quality is sufficiently supple and the drive is quite entertaining with a quick and nimble attitude. So you’re not completely convinced that 150 miles is enough for you? Well, the 2019 Leaf will be available in a longer range version with about 225 miles of driving range, of course at an increased cost. This all-new second generation LEAF certainly has fallen far from the tree, tweaking and improving what was already very good.